Few weekends ago, I flew to El Paso, Texas then took a 3 hour car trip south to Marfa for my friends’ wedding. I have heard of the town but didn’t know much about it except that part of “No Country for Old Men” was shot in Marfa. Obviously, I did extensive research on where to eat and how far are each places from my hotel. One thing I did do a search on was for fried chicken. Though sadly, the only fried chicken I found in Marfa, Texas was at the Fat Lyle’s food truck but they only serve it on Sundays. My flight back to NY was Sunday am which meant no fried chicken in Marfa. I guess it was ok to skip a week of not eating fried chicken……probably better for my health. On my first night there, my friends held a big friends and family dinner at Mando, a Tex-Mex restaurant in Marfa. As I was scanning the menu, something caught my eye. Between the hamburger steak and the grilled chicken breast was a dish called chicken fried chicken. CHICKEN FRIED CHICKEN!? And not just chicken fried chicken, it was chicken fried chicken with gravy. Oh, I had to get it. Ladies and gentlemen, for $9.95 you get a deep fried chicken breast and covered in gravy served with a piece of toast, salad and a potato item (I picked baked potato). Dear readers, I have never seen such awesomeness on a plate before. The chicken breast was crispy and crunchy, surprisingly juicy but a little bit salty. Though of course if you mix in the gravy and baked potato and ate it with the toast…then it was just pure joy. Forget the chicken fried steak, this is the real deal. I love you Marfa, Texas. Final thoughts: If you’re in Marfa, Texas you should definitely try this dish. 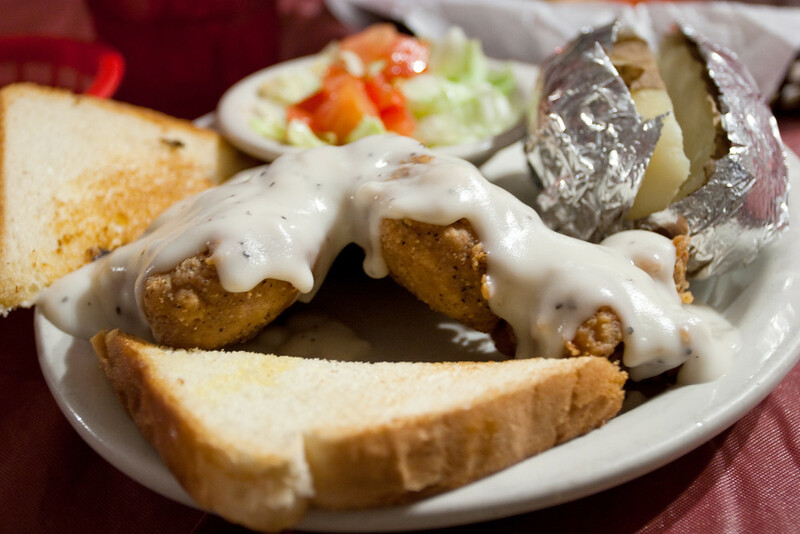 For $10, you get a lot of food and gravy over fried chicken..that’s pretty much a big fat warm hug from Texas.